FringePop: Original Photo of Butch Cassidy and the Sundance Kid? 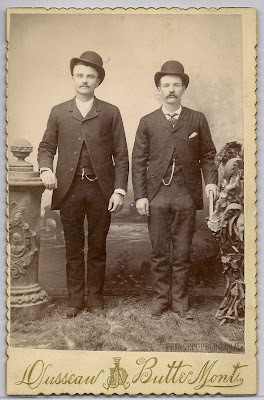 Original Photo of Butch Cassidy and the Sundance Kid? 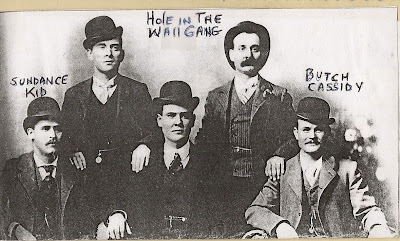 The second photo shown is a known photo of Butch Cassidy and the Sundance Kid. The first photo is a an original mid 1890's cabinet card from my collection that I strongly believe is them. The photo was purchased on eBay from a seller, who had already sent the item to Sothebys for examination. Sothebys couldn't confirm that it was the pair, but they couldn't disprove it either. After examining the history of Butch and Sundance, I have a strong belief that this is them. Butch and Sundance were travelling in that area around the time the photo was taken. The photo's time period can be dated specifically on the basis of the design of the edges and the markings used by this specific photographer. The dress is correct, and I believe they are about the right age. The features and heights of the men are on target, and Butch and Sundance were known to randomly get their photographs taken when they were travelling. It's hard to say for sure that this is them, because so few photos exist to compare it with. Whatever the case, the photo has a fun story to tell even if it does prove to be yarn. It would be great to see this investigated on "History Detectives". Great blog! I just discovered it through my friend Jim Linderman's blog. You might like a few things on mine. I haven't seen the show, but it looks pretty easy to make submissions to them. I'll have to look into it further. Welcome to my blog, too, and thanks for sharing yours!